I’ve been procrastinating about writing a time budget for a household move. Two years ago a friend asked me to write something like this on my own blog but I never did. I think it’s because timelines can be a bit subjective and everyone’s move is their own unique story. That said, I’ll keep this as neutrally applicable as possible and stick to general ideas to help provide a few important guidelines. As always, I welcome any additional suggestions that match today’s topic. 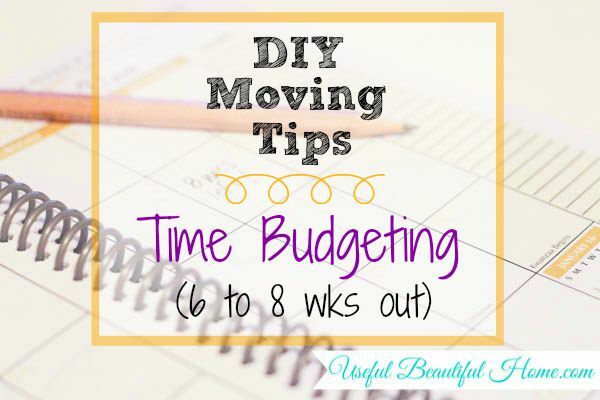 If you have something related to using time wisely in the 6 – 8 weeks prior to a move, please leave a comment below! 1. If you haven’t already, stage your home (assuming you’re selling). I could write a book about this subject! I love staging my home for a move because it really focuses my efforts on ridding excess clutter and making rooms inviting. 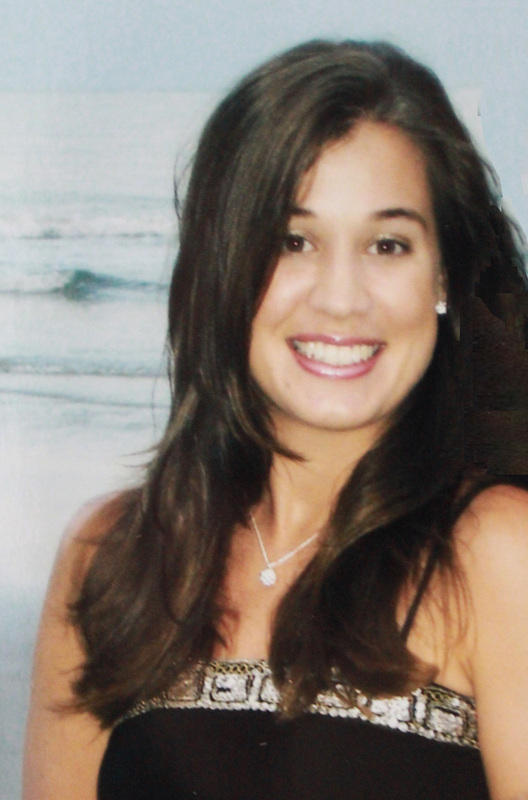 There are all kinds of helpful tips on home staging, so I won’t hit those highlights right now. However, I will share that removing general clutter, clearing off countertops, and ridding the surfaces of personal items and/or knickknacks is vital to staging. Highlight pretty features in your home. A beautiful window, for example, can be staged with a set of cozy chairs and an end table between them so your future home buyer can envision sipping her morning cup of coffee while he reads the paper. But, only place a single object, like a lamp, on the table surface. Less is definitely more when trying to sell a home! 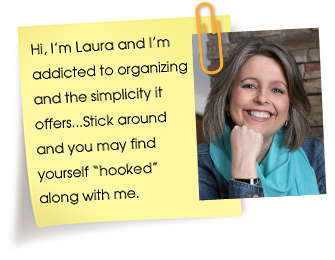 So when I talk about staging from an organizing point of view, I’m really talking about de-cluttering and Laura has many wonderful tips (HERE) on that topic! 2. Stop bringing it in, just stop! This is so hard but I really encourage you to put a freeze on spending unless it’s related to your move. No need to buy next summer’s clothes if you’ll be moving soon, even if they’re on sale. I know, it’s hard to walk away from a sale, I feel your pain. 🙂 Avoid places that make you want to bargain shop until after you move. Habits are best to put on hold while you focus on moving. This includes the staging of your house. Don’t bring in more items just to help sell the biggest item of all. Focus on removing or re-using things around the house to help “stage” for buyers. 3. This transitions us nicely into the next point; sort, donate and pitch. 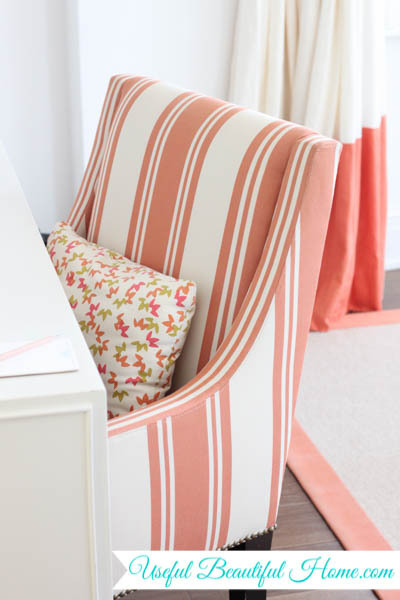 Start the process of sifting through and down sizing those hidden clutter zones in your home. Pick a place, it doesn’t matter where – kitchen cabinets, spare rooms or closets – just get started removing the unwanted or finding a better home for your unused items. To be honest, this is something to do before putting your home up for sale because it helps closets and storage spaces look bigger. 4. Sell it. We usually have one garage sale related to our move, either before moving or on the unpacking side of the ordeal. Either way, I usually plan on the calendar an ideal date to host a garage sale before we move. That way, I have more motivation to purge my spaces prior to packing. Nothing frustrates me more than moving a bunch of things we ultimately never use in the new home. I’d much rather sell or donate those items for better purposes. 5. Clean the yucky spots. Put on buyer’s goggles and look around for places that would gross you out if you were buying this home. Trust me, even the cleanest of clean people have spots of dirt and grime that get overlooked in the weekly chores. 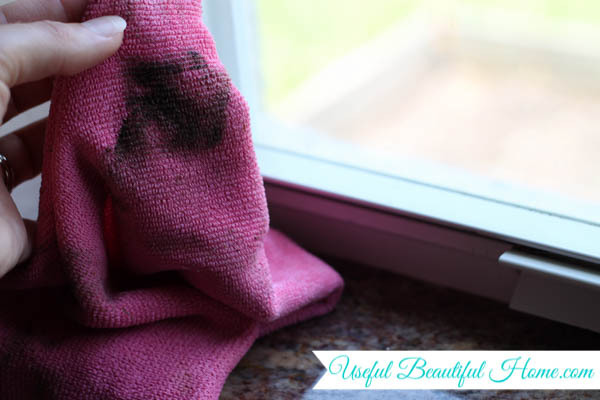 Grab your trusty cleaners (I love, love, LOVE these products) and get to work removing eye sores in your home. Nothing sells better than a clean and tidy home! 6. Do your homework about moving options. I know we’re talking about a DIY move, but at some point you’ll need a little help. Perhaps just a few friends will be moving your furniture to the new home or maybe you’ll be hiring a company to transport that precious piano. Either way, know your options, scout out the competition amongst the professionals and make a choice who you will use when the time comes. In fact, if you’re certain about your moving dates, then I suggest booking the moving company, professional help and/or moving vehicles now. It never hurts to have those details arranged in advance. 8. I learned this one the hard way, get copies of important local paperwork! I had a doctor’s office that would not mail records without me requesting them in person. The trouble was, I realized that after we moved to another state. So, before the hubbub of moving really gets started, take these earlier weeks to track down records from physician’s offices and school facilities. Then, label them in a large envelope and put them with your other important papers. Oh, and remember to label your box in case you need those records before getting completely unpacked. I also highly, HIGHLY encourage you to visit with friends. If I had to complete my task list with an even number 10, it would be to make time for relationships, especially if you’re moving out-of-town. No amount of de-cluttering in these weeks will ever out shine the value of loved ones! These are the “easy” steps my friends but don’t loose sight of getting it done early. There will be plenty of crunch time that can potentially cause stress closer to the moving date, so use this time wisely! In other words, don’t procrastinate (ironic, since I started by sharing about my own procrastination, haha). I’ll be back again soon with our next time guidelines for moving. Happy weekend!